Ginjinha is a Portuguese liqueur that’s made from combining aguardente and ginja berries, a sour type of cherry that’s known in English as a Morello Cherry. The ginja berries are usually harvested around June, and are combined with water, cinnamon, and sugar and then left to infuse in the aguardente for around 5 months. Francisco Espinheira, a Galician friar at the church of Santo António de Lisboa is credited with discovering the recipe. The owner of what’s now A Ginjinha, a small bar near the church, saw the commercial opportunity the drink had and began selling it. Naturally, a lot of other businessmen saw the success A Ginjinha was having and wanted in. In the years that followed, several other Ginjinha bars opened, including Ginjinha Sem Rival and Ginjinha Rubi. Óbidos and Alcobaça, two of the main towns where ginja berries are grown, saw the success Lisbon was having with Ginjinha and ever since have been trying to capitalise on it. Both claim that they’re the original place that ginja berries were grown: Alcobaça claims it taught farming to the people of Óbidos and that’s where they learnt it. Although neither of the two towns have taken much business away from Lisbon, Óbidos has probably been more successful than Alcobaça. 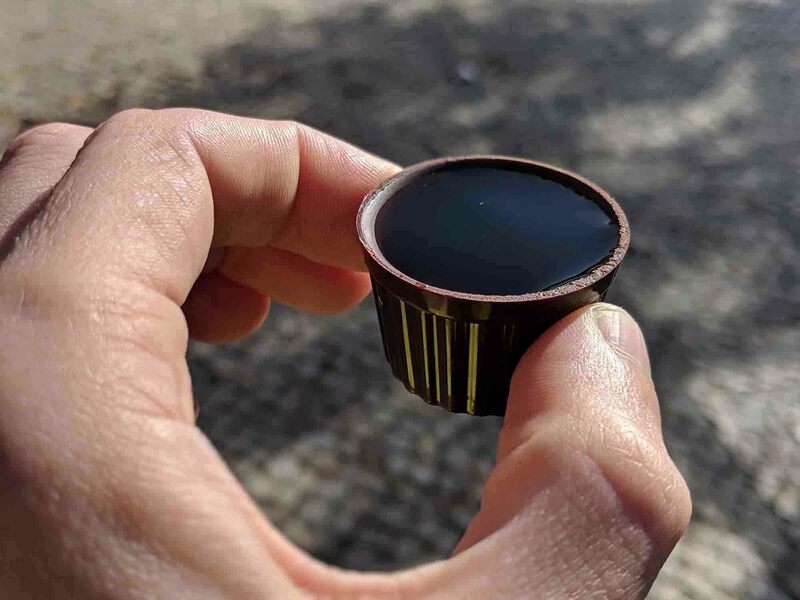 Óbidos came up with the idea of serving Ginjinha in edible chocolate cups, which proved a huge hit in both Óbidos and Lisbon. Traditionally, however, Ginjinha is drunk in a cup. Usually this is a glass cup, although there’s a good chance you’ll be served in a plastic cup. This is because Ginjinha bars are typically very small, and most people drink their Ginjinha outside. 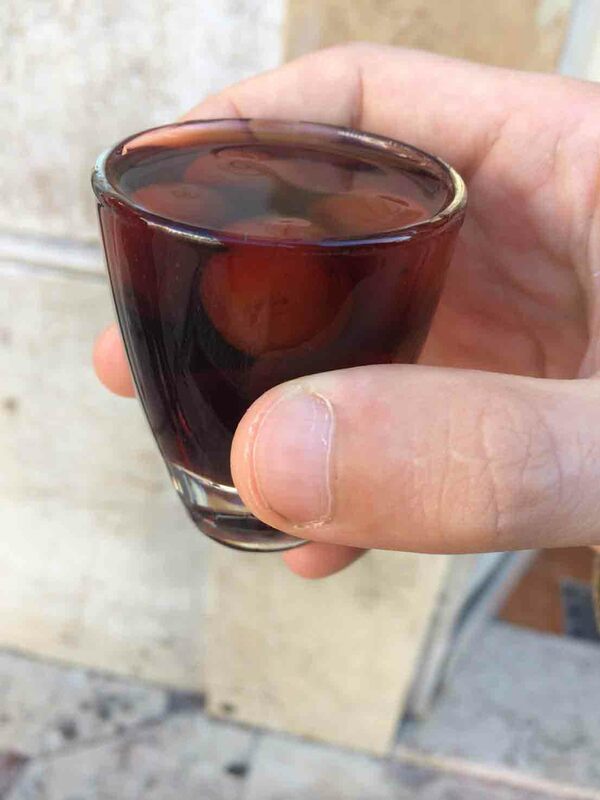 A lot of people like to hold onto their glass as a souvenir of their trip to Lisbon, which has prompted many bar owners to switch to plastic cups. As with medronho and Port wine and every other alcohol that Portugal produces, there have been a couple of attempts to make ginjinha more trendy and to find other uses for it besides the simple shot. Ginjinha da Sé in Alfama, for example, make a variety of cocktails and other drinks using Ginjinha. Com elas ou sem elas? What do I do with the stone? What time of day can I drink Ginjinha? The cherry stones are traditionally spat out on the street, and you’ll find the ground is quite sticky just outside of the Ginjinha bar. If you don’t want to do this, you can discretely spit it back into your cup. You can order a Ginjinha at anytime of day, from morning to night, and there is no cultural rule as to when it’s okay to have a glass. Some Portuguese people do drink it in the morning, but many also drink beer, wine, and even Medronho (also made from Aguardente) in the morning. Ginjinha has an ABV of around 18%, which is much lower than the 45-50% ABV Medronho typically has. 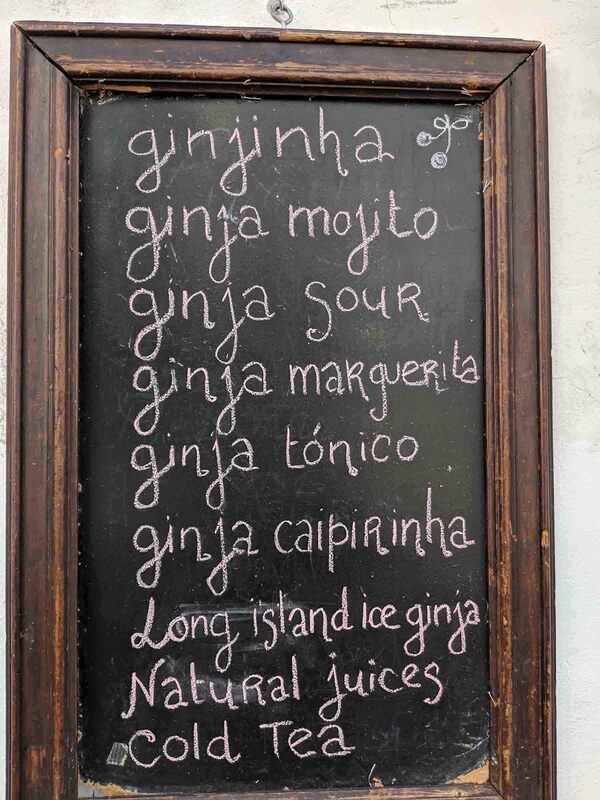 Although you’ll find Ginjinha in almost any bar or supermarket in Portugal, it’s most common in Lisbon, Alcobaça, and Óbidos. Finding Ginjinha outside of Portugal can be difficult, but it’s not completely impossible. UK: Amazon.co.uk is a good starting point. They have Mariquinhas Ginja De Obidos and Ginja Espinheira. USA: Laurenti Wines in a good option, as they have both the Obidos Oppidum Ginja and the Espinheira Liqueur Ginja. If they’re out of stock, try WTfinewine.com. Australia: Finding Ginja in Australia seems very difficult. Petersham Liquor Mart usually has at least one brand in stock, but otherwise it can be very difficult to find. Have you tried Ginjinha? What did you think? Let us know in the comments below. My daughter and son-in-law fell in love with Ginja when they were in Lisbon last September.They brought a bottle home to Vancouver, B.C. Canada,which they graciously shared with us at Christmas.All of us LOVE it.We are desperate to find a place to buy it in Canada.We would be eternally grateful for your help. I’ve had a quick look for you, and I can’t find anything. There does seem to be a store in Alberta that stocks it ( http://www.liquordirect.ca/Ginja-d%C3%93bidos-Cherry-Liqueur-P12288.aspx ) but, apart from that, I couldn’t find anything else. A lot of online Portuguese shops will ship to North America, but the shipping is usually very expensive and you’re likely going to have to pay taxes to import it.